HIM leaders know how to measure the cost of producing quality documents, but what happens when IT gets involved? Sometimes the more things change, the more they stay the same. Back in the day, a successful medical transcription service effort was defined by satisfying physicians, promptly delivering quality documentation, and keeping total process costs under control. Like most other service activities, it was a matter of juggling three shifting shells: Do you want it good, do you want it fast, or do you want it cheap? As widespread use of internet-based applications expanded the geographic reach of transcription services, the competition for market share based on softly defined cost, quality, and turnaround time (TAT) measurements became fierce. The industry soon learned not everyone measured these variables the same way and the shell game was on, especially with how vendors calculated cost and quality. To help put a stop to the confusion, AHIMA got together with the Association for Healthcare Documentation Integrity (AHDI) and the (now-defunct) Medical Transcription Industry Association (MTIA)—groups representing transcription labor and business managers, respectively—to create clear cost, quality, and TAT standards to enable buyers to effectively compare and contrast vendors, eliminate contract ambiguity, and hold services accountable. Over the past few years, the transcription service market has consolidated dramatically, ignited by widespread speech recognition deployment, followed by the emergence of physician-centric documentation in an EHR-driven marketplace. Both developments significantly squeezed traditional service vendors. 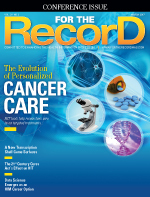 As certified EHRs began eliminating large swaths of traditional service volumes, competitors with front-end speech offerings shifted their focus away from traditional HIM departments and cozied up to EHR vendors and IT departments with an "if you can't beat them, join them" approach, which completely made sense since they were driving all of the industry transactions. With this shift, such vendors seemingly turned their backs on the HIM community and encouraged an HIM vs IT political battle. Front-end speech was promoted as the inevitable wave of the future since it eliminates transcription labor (cost), is controlled by the physicians (quality), and delivers documents instantaneously (TAT). That pitch sounded great to CFOs and CIOs. The shell game was back on. Interestingly enough, some vendors seemed willing to cannibalize their own service contracts. The logic seemed to be an attempt to avoid the headache of managing numerous people when the profit margins are much better with a pure technology sale. In some cases, buyers didn't see much of a savings, especially after adding up all the implementation costs and annual per-user licensing fees. Regardless of the motivation, it didn't take long before some technology-focused vendors recognized that the clarity HIM departments had achieved in terms of how to measure cost and quality to compare vendors simply didn't exist in the IT community. In years past, physician satisfaction with clinical documentation meant the system was always available to dictate and reports were returned on time without errors. If vendors changed, everyone did their best to transition as seamlessly as possible to keep the physicians happy. However, government mandates to adopt EHRs forced physicians to change how they documented, whether they liked it or not. Regrettably, the industry learned quickly that physician efficiency was quite low on the list of EHR design objectives. Accordingly, physician satisfaction with the documentation process suffered. The ignored elephant in the room, however, was that the negative reaction was not due solely to physicians being forced to do things differently. The fact that EHR workflow had turned physicians into documentation specialists was being overlooked. It seems the more sophisticated the EHR, the more vendors justified the cost of the purchase by promising the elimination of traditional transcription labor as well as a portion of traditional coding support. Workflow charts and canned demos to the CFO and IT departments made it all look easy. In reality, however, reports suggest the new workflow added 60 to 90 minutes to the physician's day compared with traditional transcription. Although competing vendors tout the comparative efficiency advantages of their productivity tools, in all EHR environments, physicians see fewer patients due to the increased documentation requirements and inherent physician's role in generating and inputting that content. For example, speaking under the condition of anonymity, one chief operating officer says some long-time physicians claim they are losing $80,000 or more per year in personal income due to the reduction in their patient load. The only options recommended by EHR vendors are implementing front-end speech recognition or hiring scribes. In either case, to return to previous patient visit rates, more money needs to be spent. Returning to traditional transcription was summarily dismissed as old school, even though technology exists to process traditional reports through natural language processing to auto-abstract discrete data and autopopulate certified structured reports. This enables physician-preferred document creation with all the downstream benefits of the certified EHR. Opponents argue that's a step backward and costs too much. Proponents say do the math and compare it with the cost of the reduced per-physician patient load. But it's often difficult for organizations to admit that magnitude of an error given the time and money they've invested in the EHR. Here is where the current shell game has been heating up. Looking past the studies that show clinical documentation workflow schemes dependent on front-end speech recognition pass along four times more errors than traditional transcription (0.33 to 1.33 errors per report) and point-and-click systems with physician self-type workflows are considerably worse (7.8 errors per chart), how quality is measured has once again become an ambiguous issue. Cynics may say it's a priority for HIM professionals while vendors view it more as an opportunity to fiddle with key performance indicators (KPIs). In July 2010, AHIMA, AHDI, and MTIA updated and expanded the previous standards on cost, quality, and TAT while retaining a longstanding, straightforward document quality scoring system that assigns point values to different types of errors. For example, punctuation or spelling errors have a point value of one while mistakes impacting care, such as misused medical terms or demographic errors, have a point value of three. These standards apply regardless of the document creation workflow method being used (traditional transcription, front- or back-end speech recognition, physician self-type, etc). Most outsourced service contracts include a requirement to maintain at least 98% accuracy. Keep in mind, however, that the AHIMA standard calls for a point value score of 98, not 98% accuracy; there's a huge difference between the two. Some vendors exploit that difference. It's relatively easy to configure back-end speech recognition software to count the number of words in a document as well as track the number changed during the initial editing phase. That does not mean the speech recognition draft was accurate or the number of words that were changed resulted in a true quality document. The average acute care document in the United States contains 300 to 350 words. If you consider each correction as a percentage of all words in the report, it's possible to make six or seven corrections to a speech recognition-generated draft and still meet the 98% accuracy target. Clearly, any document with half a dozen errors is unacceptable in the HIM universe. More importantly, quality audits occur after that initial editing phase. Be alert for vendors that provide spreadsheet-type "quality reports" indicating strong numerical results without a description of the types of errors identified in the audit and the corrective actions taken. (It is actually an incomplete quality assessment of their speech recognition engine, not a true quality assessment of finalized reports.) Organizations that receive this type of a quality report should check their contract for any reference to the AHIMA standards. Should such language be absent, be sure to add it during the next renewal—or change vendors. It's important to note that the AHIMA quality standard is a document score of 98 or better based on error-type deductions. Given that a single document error (a misused medical term) could result in a three-point deduction and a failing score of 97, it's essential to receive error-type details in the quality audits. Failure to do so means the vendor is not providing quality assessments that comply with AHIMA best practices. Service cost seems to be the most active shell of them all. Long ago the costs associated with service contracts were straightforward. At first, health care organizations were expected to pay by the hour, then by the page, then by the line, and now by the visible black character (VBC) as recommended by AHIMA. Each step to a smaller, more precise unit of measure was expected to bring an end to the rampant volume-calculating shell games that were giving the industry a black eye. In transcription's volume-based market, a vendor's life or death as a business is highly dependent on their 65-character line or VBC rate. Unfortunately, this motivated some vendors to artificially inflate volumes so they could offer lower rates while still effectively charging more per document. This volume-based shell game helped some vendors prosper while putting lots of others out of business. The move to the VBC standard was, in large part, motivated by creative vendors that included credit in their contracts for "all characters that contribute to the final look of the document." Unfortunately, this allowed vendors to count the electronic data that defined which font to be used, where margins were set, and other document formatting issues that indeed "contributed to the final look of the document" but really just inflated the total volumes being credited per report. More recently, the volume-inflating shell game has found new life with a fresh twist. Whether contracts are technology-only agreements for in-house staff or full-service contracts with separate technology components, the new game is all about the "industry standard" volume credited per document for headers and footers. Specifically, there are vendor contracts that refer to the "industry standard 15 lines of credit" per document for such content. No such header and footer volume standard has ever been adopted or encouraged by any of the industry associations (AHIMA, AHDI, or MTIA). HIM professionals know that an industry average for headers and footers may be three to five lines (at most) based on the specific facility's report formatting. More importantly, if documents upload to an EHR, header and footer content often is stripped away from the transcription effort and generated directly from the EHR. As a result, the used volume is zero. Even if header and footer content is not stripped away by the EHR, most vendors concede that volume for free in competitive bidding situations if prompted by the buyer. HIM professionals know that; most likely, CFOs and IT departments do not. The impact of this particular shell game is significant. For example, consider the average acute care document, which contains 50 to 55 lines. Crediting an extra 15 lines for headers and footers inflates the document volume by 27% to 30%. Radiology documents average only 10 lines per document, but add credit for headers and footers and they're no longer the bargain they appeared to be. Now that the motivations for wholesale process reengineering in pursuit of meaningful use have begun to fade, health care organizations are reevaluating their physician satisfaction, document quality, and total process costs. Unfortunately, as organizations are catching their breath, many are left with empty pockets, unhappy physicians, questionable quality issues, and shady pricing. It should come as no surprise that during this same period of turmoil, information governance and clinical documentation improvement efforts have emerged as key components of successful health care organizations. Thus far, most of these efforts have focused on process reengineering, quality control, and regulatory compliance. Moving forward, expect physician satisfaction, measured improvements against KPI objectives, and cost control to reemerge as primary objectives. With that realignment, vendor relationships and the results delivered by the clinical documentation process are due to be reevaluated. As this future takes shape, it's important to remember the lessons learned during the rush of EHR implementations, namely that separating IT and HIM causes considerably more organizational pain and cost than it ever saves. Such separation fostered the transcription shell game that negatively influenced physician satisfaction, document quality, and overall process cost. It's time for HIM to take the lead, data analytics in hand, and do some house cleaning. If vendors do not follow the AHIMA guidelines for clinical documentation quality management and best practices, or are charging for headers and footers, someone must be prepared to call them out.